Marking the upcoming World No Tobacco Day, Palli Karma-Sahayak Foundation (PKSF) arranged a seminar at its auditorium in May 28, 2017. Different anti tobacco campaigners and institutions joined the seminar and agreed upon the proposition of working together in an anti tobacco network led by the Chair of the seminar, Dr. Qazi Kholiquzzaman Ahmad, Chairman, PKSF. 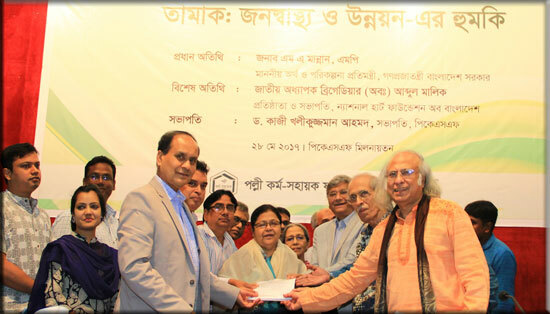 Board members of PKSF and executives from its Partner Organizations (POs), media journalists and government officials were present in the seminar. 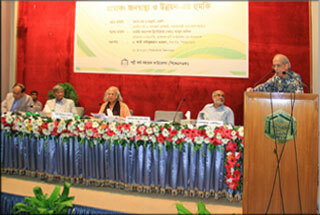 In his welcome address the Managing Director of PKSF Mr. Md. 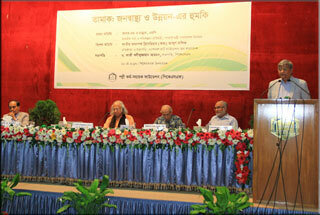 Abdul Karim urged upon implementation of effective policies to reduce tobacco consumption. Mr. Md. Golam Touhid, Deputy Managing Director, PKSF, delivered an informative speech through a presentation on negative impact of tobacco consumption over health and agro-economy. Mr. Touhid presented an overview of the PKSF. Then he made some suggestions for considerations of all parties concerned regarding tobacco issues. The seminar got momentum and became vibrant with the recommendations from representatives of respective anti tobacco bodies who were present in the seminar. The special guest of the seminar National Professor Brig. (Rtd.) Abdul Malik, President, National Heart Foundation of Bangladesh justifying the root cause of tobacco problem in Bangladesh said that, nicotine is a highly addictive substance in tobacco products and tobacco companies are ran by influential people with ill-business motive. The government should levy higher tax rate in order to make them face a soaring price in their production. 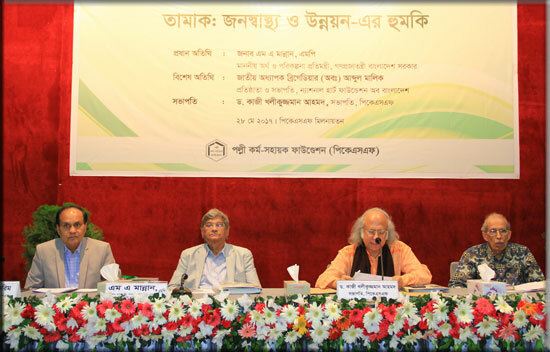 The chief guest of the seminar Hon’ble State Minister of Finance, Mr. MA Mannan MP, stressed upon the current government’s mandate of making a tobacco-free Bangladesh within 2040. He further said that, the upcoming national budget could be reviewed if required and as an imminent issue, tobacco companies got no exemption in this regard. 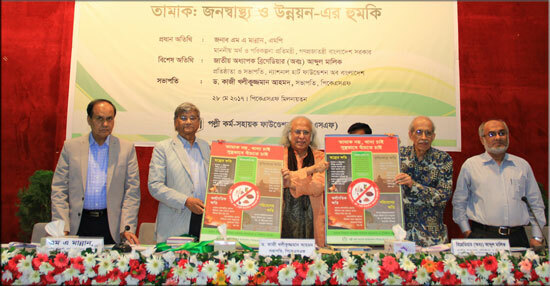 PKSF Chairman Dr. Ahmad invited Hon’ble State Minister Mr. Mannan to unveil two anti tobacco posters. These posters would be distributed to disseminate knowledge and awareness building about anti tobacco issues.